It becomes quite a difficult job for the parents to choose the backyard playground slides. Here are the certain things that you should consider while selecting the playground slides for your kids. 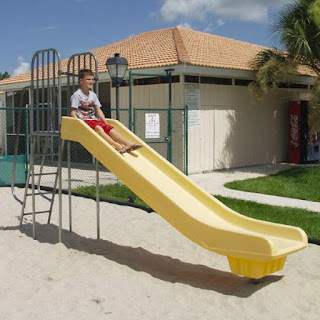 When you will start looking for the residential slides, you will get to see different types of slides that include Twist & Shout, Rumble Seat, Tube, Spiral and Tunnel slides. First thing that you need to look for in the slide is its height. The height of the playground slides is the important factor. If your kid is below 5 years, you can choose to have an 8 ft. high slide for him but if your kids are above 5 years of age, go for 12 ft. high slide that can provide them the ultimate fun while sliding down. The next thing that comes in the check list is the material used in designing the slides. Residential playground slides are usually made of plastic and metal. Plastic playground slides have some added advantage over metal slides. Plastic slides do not get corroded like metal slides. Also, the plastic slides are resistant to moisture, bacteria and moisture. Metal slides easily get heated up under the sun. Therefore, it is also advisable to parents to install plastic playground slides in their backyard. Another important aspect that you should consider while purchasing the backyard playground slides is the safety. Before purchasing the slides, ensure that these are designed in compliance with safety measures.